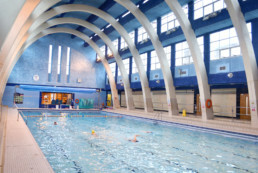 Recognised by Historic England to be a particularly good example of a Modern Movement swimming pool. 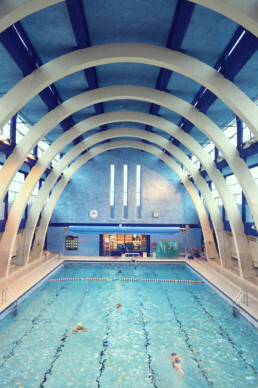 A series of dramatic arches span the swimming pool which was said on opening in 1936 to have “the dignity of a modern cathedral”. Large side windows let natural light flood the pool. The art deco influence is evident in the building, in particular the Turkish hot rooms which are vividly decorated in black and cream tiles. Additions to the building were made in the 1970s including the provision of a teaching pool. 33 1/3 yard pool, 25m teaching pool, health suite (Turkish hot rooms, steam room, plunge pool and sauna), state of the art gym and fitness studio. The quality of the design is thanks to the vision of the then Chair of the Baths Committee, Cllr Bassett-Lowke who was a champion of Modernism and had his home ’78 Derngate’ interior designed by Charles Rennie Mackintosh. 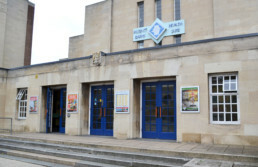 This is now a visitor attraction in Northampton. To restore the health suite back to its original design.